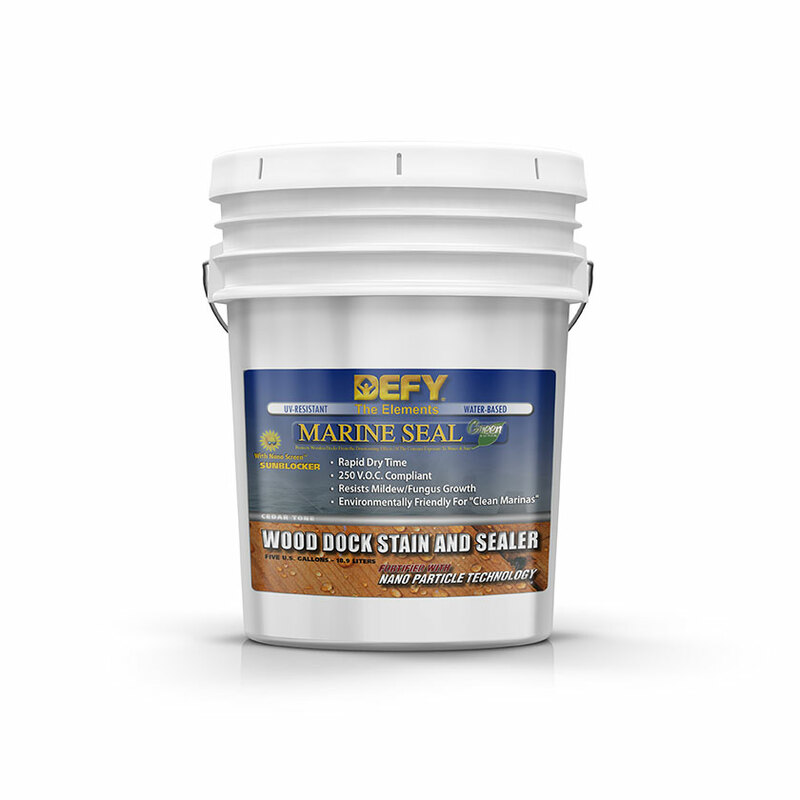 DEFY Marine Seal Wood and Dock Stain is suitable for use on all types of wooden docking materials, providing extreme durability against the harmful effects of exposure to both fresh and salt water. 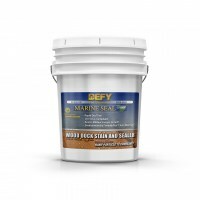 DEFY Marine Seal has been specially formulated using state of the art nano-particle technology to provide superior resistance against ultraviolet color fade and mold and mildew growth. Do not apply Defy Marine Dock Stain to painted surfaces. We ship to your area directly from our website. Can the Defy Marine Wood Stain be purchased by the gallon. Only comes in 5 gallon pails. How long should new PTP age prior to applying Defy Marine Wood Stain? 3-4 months and you will need to prep the wood first. How is the Defy Extreme Marine applied? Is brush, roller, or sprayer the preferred method? Can I get samples of the colors for customers? I have a white cedar dock in aluminum frame- cedar pieces are placed in the frame each year. It is on a lake in Maine- was out one season with no treatment- as suggested by the builder. Which product do I use on it now? Color? The log cabin dark brown. The dock is 30' long, 6 wide and over the water- sometimes submerged. It was in a boat house for the winter but will probably be stored outdoors but removed from the lake from October- May. Yes you can use the Defy Marine Stain. Nay color that you like will work. 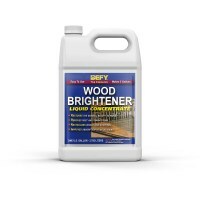 Prep first with the Defy Wood Cleaner. Dock surface was replaced last year with pressure treated pine and has weathered for a little less than a year. Clean with Defy wood cleaner then how many coats of Defy Marine sealer? 2 Coats applied wet on wet. You should let me put in pictures. After researching a long time in the library of the world, the Internet . I decided on this. I bought a house on a canal off intercoastal in Florida. The doc was moldy and horrible. Even though he was a painter used the wrong stuff. He had like 5 coats of thompsons or similar. This doc does go underwater every October with the tides. So I stripped it ( but it wasn't perfect because of the 5 coats and nontoxic? Chemicals that I tried to take it off plus I did minimal sanding. Worked great. After 2 years going to try to put another coat on top. The only thing that I would say is when my sea wall fails, and it will someday, that I will put in the fake wood. Until then, I am using this. Noticing the availability of a Marine product, what is the difference between the Marine product and the water base product? I saw that water was also mentioned to clean the Marine product brushes so does that mean there is no Oil in the Marine product? What makes the Marine product a Marine product and why would the Marine product not be recommended on all decks because of the UV protection since decks usually get lots of sun in summer even if covered with snow in winter? There is not any oil in the Marine Seal as it is water based. The Marine seal is a different formula then the Defy Extreme. It is more "flexible" for marine conditions. It will have the same UV and mold protection as the Defy Extreme. What would be best stain option for pressure treated pine floating dock over quiet lake. Wood is about 1 year old, nothing had been applied. Extreme, Marine or something else ? Either would be fine but I would suggest the Extreme version. is it preferred to use wet on wet or one coat as listed on can?? Depends on the wood type and age of the wood. New wood and dense hardwoods will need only one coat. Older/dried out cedar or PTP would require the 2 coats applied wet on wet. Prior oil base (Olympic Maxxum) stain was applied probably over 6 years ago. Area has been pressure washed and dock looks like stripped wood. Is it OK to apply with no further treatment? The dock is about 600 feet long by 5 feet and is over salt water. Which product is best? 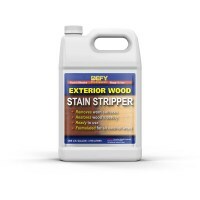 As long as all of the old stain is removed then you can go head and apply the Defy. Use the Defy Marine Stain. No it does not come in gray and no it does not fill in cracks. It is a penetrating stain. Our dock is 400 SqFt cedar. We want to do both sides of the dock, so 800 SqFt total. Do we need two coats on the bottom side? Should we purchase one or two 5 gallon containers? Do two coats to be consistent. For this you would need about 8 gallons for two coats. Do you offer it in 1 gallon? Can it be tinted darker? thank you. would brightener not be needed? Not when you already have a base coat. Prep first with the Defy Wood Cleaner and a light pressure wash rinse, let dry for 48 hours hours, and reapply the Defy Marine.